After I posted another picture of a client under the lamp yesterday I had quite a few questions about LED and what it entails. As it’s currently one of my favourite machines (after my dishwasher 😉 ), I thought I’d give you a very brief lowdown so that you can seek out the treatments in your local area. LED stands for Light Emitting Diode and works on the principle that light, used in the correct, clinical way, is massively beneficial to the skin. While we usually associate light exposure with negative effects such as skin ageing and damage, light can have massively positive influences on your body. It helps produce vitamin D – which 1 in 5 of us in the UK are deficient in*, boosts energy and serotonin levels, and also promotes healing, reduces inflammation and pain and can prevent tissue damage. 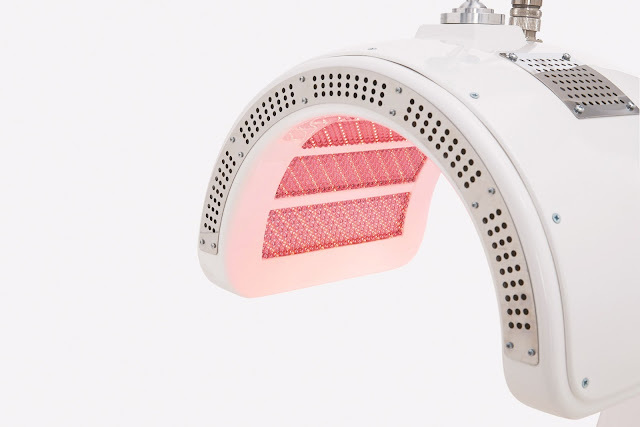 LED Phototherapy is known for its regenerating and anti-inflammatory properties. Research has shown that it increases collagen production, destroys acne-causing bacteria, reduces inflammation, improves skin tone, texture and clarity and can ease muscular and joint pain. In a treatment, it’s the perfect way to round off an aggressive procedure, whether or not that is peels, micro-needling, dermaplaning, or invasive needle work, hence why it’s so popular. When LED was first around, I personally found the machines a little harsh – or unrefined. They would trigger headaches in me and I just never really got on board with them. 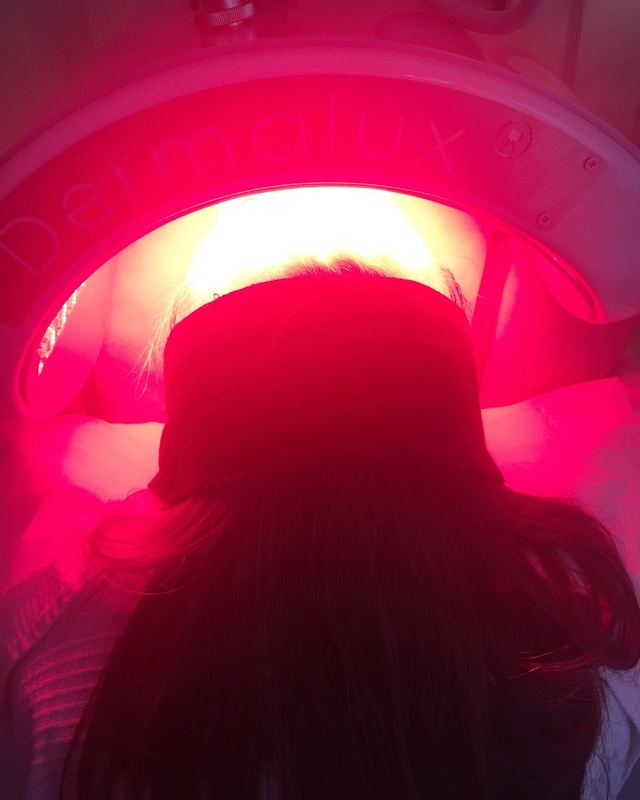 The newer versions – and especially the Dermalux machine, are honestly brilliant. Both in terms of ease-of-use for a therapist and the results for the clients. The joy of this is that you can lie/sit down for 20 minutes and get up and go back to work. It’s one of the few treatments that you genuinely can do on a break. I mainly use it on two settings: skin rejuvenation and varying types of acne. and can be used on all ages, all skin types, all skin colours. It’s super effective when used as a course, and makes the perfect pre-wedding course of treatments for brides-to-be, or people with big events to attend because the effect is immediate and there is no down time. You walk out glowing. Literally. For acne sufferers, you’re looking more at blue light, same machine, different colour of light. The effects are genuinely noticeable, especially when you have the treatments regularly, starting with an intensive course, then reducing down to maintenance appointments. Dermalux have a clinic locator on their website – Clinic Locator that you can use to find your nearest clinic offering their services. Honestly, try one. I love it. If I could afford it I’d buy one for my house. On that note, I know there are hand-held devices for use at home. I haven’t used them. I will look into them, but in the short term, have a treatment with a pro and see how your skin reacts to the machine. Speak to your therapist. It’s my experience that once something is in your house you don’t use it as much, and that defeats the object..
**there are other LED machines available but I cannot vouch for them in the same way, as I haven’t used them professionally.